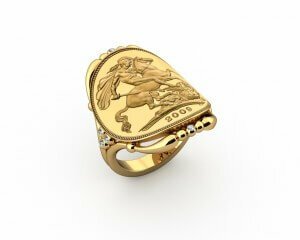 To mark a special occasion such as a charity ball, a landmark anniversary, a wedding of a close friend or relative, or a birthday celebration, a custom made dress ring can be simply sensational. Also known as cocktail rings, as they were often worn at cocktail parties, dress rings tend towards the opulent. That said, they look so good that they can also be worn on an everyday basis if you wish. Traditionally the choice of women, as with engagement rings, more and more men are opting for wearing a dress ring to complement a unique occasion. Below you can see just a few of the possibilities on offer. For example, the Avra three stone ring is an eye-catching option, especially as the centre stone can be sapphire, ruby, emerald or almost anything – perhaps a suitable birthstone to match a birth month? 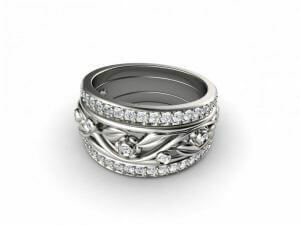 With these and all our rings, we can advise on what goes best with what looks, the size of the band to match different size fingers, how they work with other rings you might want to wear, and so on. With a custom made dress ring, there are so many possibilities that what you see in this section is just a starting point. You’re welcome, for example, to submit a photo, a web link or a sketch of a design you have in mind – Joseph George can discuss the possibilities, the design process, the types, cuts and sizes of possible gems, and also give you a no-obligation quote. 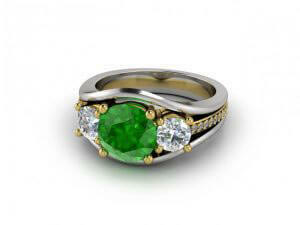 Custom rings such as these are also perfect for marking renewed commitment – eternity rings, in other words. 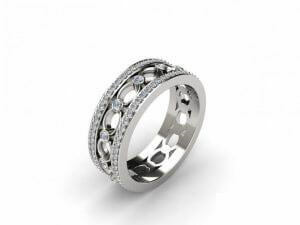 The plethora of gems in the Clytia custom eternity ring certainly makes it perfect in that respect. Eternity rings are often given after the birth of a first child, after a year of marriage, or indeed to mark any later anniversary. Many anniversaries are traditionally marked by gifts that aren’t related to precious stones, such as paper, leather, silk and so on, but if you’re traditionally minded (and have been married long enough) then think about an eternity ring featuring certain precious stones or medals at certain times. So silver for the 25th, pearl for the 30th, ruby for the 40th and, of course, gold for the 50th. You’re meant to wait until the 60th anniversary for something diamond-related, but that seems an awful long time to us – our advice is that diamonds are just perfect for any anniversary or occasion. For more details, visit our shop in Melbourne’s Central Business District, or contact us by phone or email.